I thought it looked like they had a locomotive parked in the backroom. Such an industrial sketch. Coffee shops: Our 21st century assembly line. Very nice. Can the public watch the process or did you have special access? Great sketch! Love this sketch! Great capture of the activity. They have a bar with an open window so you can talk to the folks in back and smell the coffee roasting. They have an open window with a bar and stools. 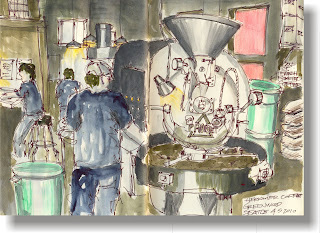 You can talk to the folks in back and smell the roasting coffee beans.